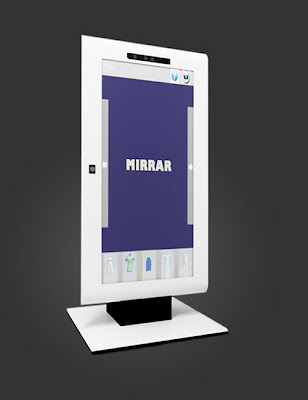 Mirrar, this smart app will have you fantasising yourself sashaying in styles and posing in garments you would dream of! As though the tyranny of choice from scores of tantalising dresses and accessories isn’t enough to strain your ‘How-Will-I-Look-In-It’ and ‘Will-It-Look-Worth-My-Spend’ Worrying Departments at a store, boutique or sale, there’s this burden of shuttling bundles up and down to a trial room, waiting in more queues, just to learn that the M Size here was a tad too short or that organdie there clashes with the likely mood at the coming party! Wrapping all these woes in a one-stop leisurely solution - a display screen, Mirrar is a product developed by graduating B Tech students at NIT Suratkal via their venture Rhapsody Labs. Mirrar saw good interest from garment store chains and e-commerce portals at the Startup Expo, part of the Entrepreneurship Summit at IIT-B this January. 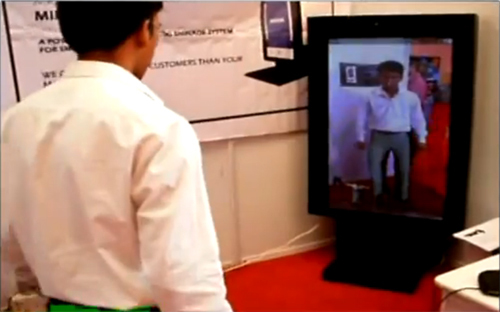 “This hardware-software integrated solution using cameras and a large display shows your image in 3D, duly fitted with the garment selected by you, in its simulated look-n-feel, once you stand in front of it,” informs Mr. Siddharth Chilukuri, CEO at Rhapsody Labs. 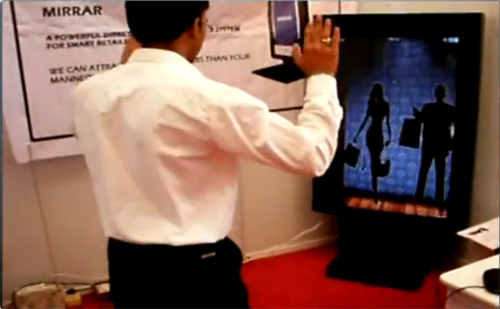 You may change various postures and change your choice by gesticulations in front of the screen, which are all captured by the cameras and simulated with the selected garment. Properties such as texture, fall and crease of the fabric are also simulated. Mirrar has three main applications: Digital Mannequinn, Virtual Dressing Room and Remote Showcase. What’s more, in case of on-line stores, which do not afford 2-way camera access, you just need to provide basic dimensions along with the code-selected garment, only to have your body outline shown on your PC monitor, along with your chosen garment. Further, there are features like registration, customer-profile and store-to-store networking, which will allow all merchants deploying Mirrar to cater to your own very special size, colour and style tastes and serve you their best. You will thus be able to access the entire range of a given store across all its locations, as well as search from other merchants. Promotional offers and hot deals are another extension of the possibilities. Let’s hope Rhapsody Labs firms up deals from all its potential clients. I actually came in looking for Property Portal In India but google brought me here, never mind i was lucky to find this wonderful Mirrar Application. Thanks for the share dude!